1. Fourier series on T; 2. The convergence of Fourier series; 3. The conjugate function; 4. Interpolation of linear operators; 5. Lacunary series and quasi-analytic classes; 6. Fourier transforms on the line; 7. Fourier analysis on locally compact Abelian groups; 8. Commutative Banach algebras; A. Vector-valued functions; B. Probabilistic methods. '... the third, revised, edition ... Katznelson managed to improve on a seemingly perfect book!' 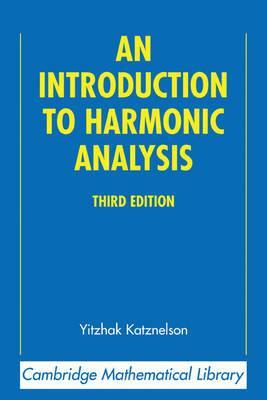 Nieuw Archif voor Wiskunde "Katznelson's An Introduction to Harmonic Analysis is, of course, a classic...So the first thing to say is 'thank you,' to Cambridge for doing this new edition, and to Prof. Katznelson for undertaking the task of updating his book...It is an ambitious book, moving all the way from Fourier series to Banach algebras and analysis on locally compact abelian groups. It is densely but clearly written, with the occasional flash of wit."